The disavow process can sometimes be time consuming, and it can be hard to determine which links should be disavowed. The Moz spam score metric is used to help measure penalisation risk by identifying 17 factors known as spam flags which helps speed up the the disavow process. 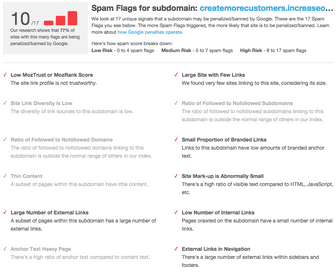 Working at subdomain level, the spam score records the quantity of spam flags and correlates them into a score out of 17. If the score is high then that means that subdomain is likely to be added to the disavow file. The spam score tool can be located in Open Site Explorer, and then once you submit the URL you would like to analyse, the spam analysis tool will appear on the left. 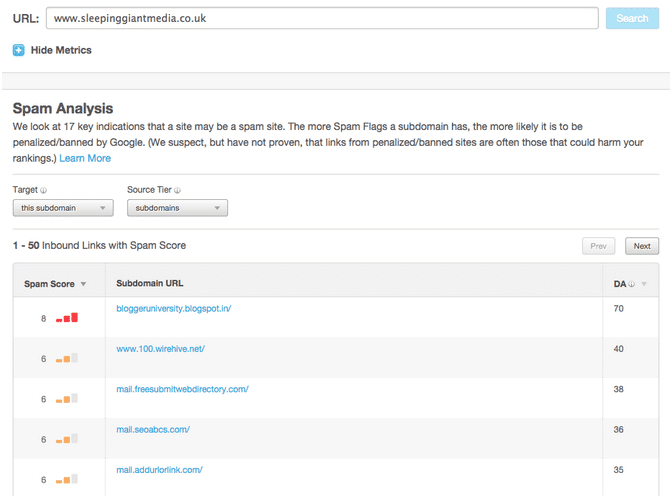 Then a chart will appear showing the inbound links with the spam score down the side. Red means the link contains spammy factors, amber means it’s in-between and green means it’s a healthy link. If you click on the spam score it will show you the things wrong out of seventeen, such as low Moztrust or MozRank Score. This example has a spam score of 10 out of 17 which gives us the indication that this link will potentially be disavowed. If you download the Moz extension bar the spam score features in the centre. This can also help aid outreach when looking for websites to work with. Moz has stated the spam score should be used as an aid for disavow because if the links with the highest spam score are added to Google Search Console without being checked it could potentially harm your website. The best thing to do is to use it as a starting point. What do you think of the new spam score? Have you used it? Let us know in the comments below.